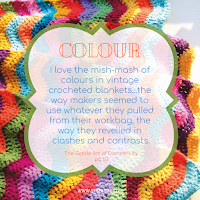 Last week the gentle art of domesticity linkup was cancelled. Jenny was not well with migranes, and family health issues, and of course this horrible weather, with continual rain is just getting everyone down. Today the skies have cleared a bit, and there was a lovely post. I do enjoy Jennys attitude to life and not to mention the lovely sewing she does - do check it here. 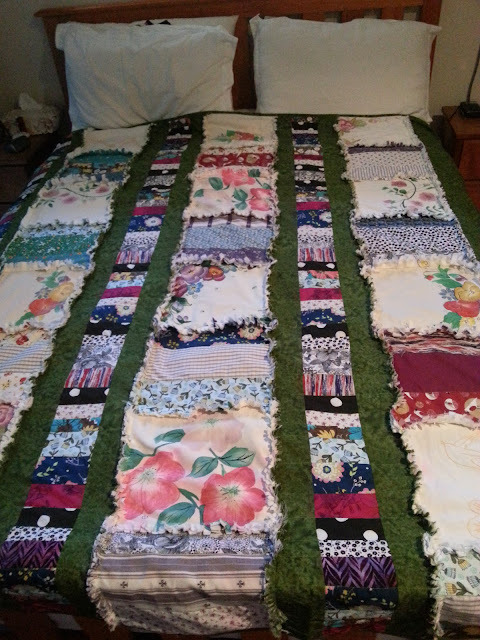 When my first grandchild was due I spent months making a candlewick quilt with the outline of a teddy bear on it. It was my first adventure into candlewick, which is essentially lines of french knots. I love the texture of rubbing your hands over these stitches. I had a candlewick bedspread when I was a child, and loved that knobbly texture. Sewing something like this allows your mind to wander as your hands keep busy. 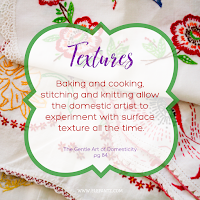 "...one of the great benefits of practicing the gentle arts is the opportunity to allow the mind to wander while the hands are occupied with chopping, mixing, knitting, quilting and stitching. Do you think the heroines of Jane Austen's novels were simply counting stitches...no, they took these chances to plot love affairs, consider suitors and plan their next moves. 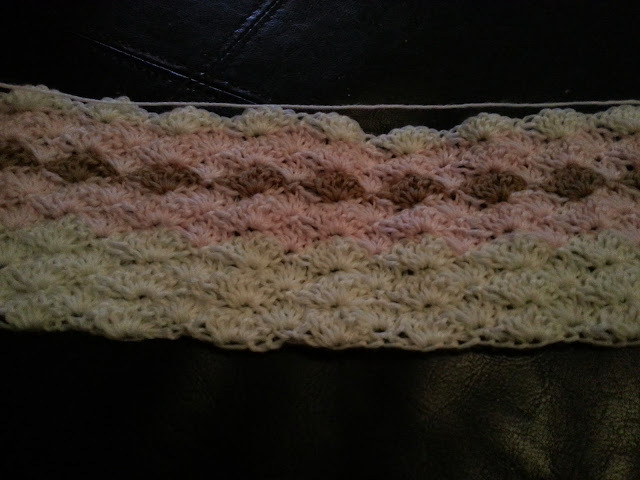 I have a little knitted baby cardigan I am making for my newest grand daughter. That requires lots of counting and following the pattern, and I must say often gets pushed to the bottom of the pile. Next weekend I have some ladies coming over for crafternoons, and we will be making beesewax wraps. In the Gentle art of domesticity Jenny refers to Lemon meringue pie as simple, but I am going to make lemon slice which I think is way simpler, and just as tasty. I am enjoying the beeswax wraps as I made a few to trial the method. 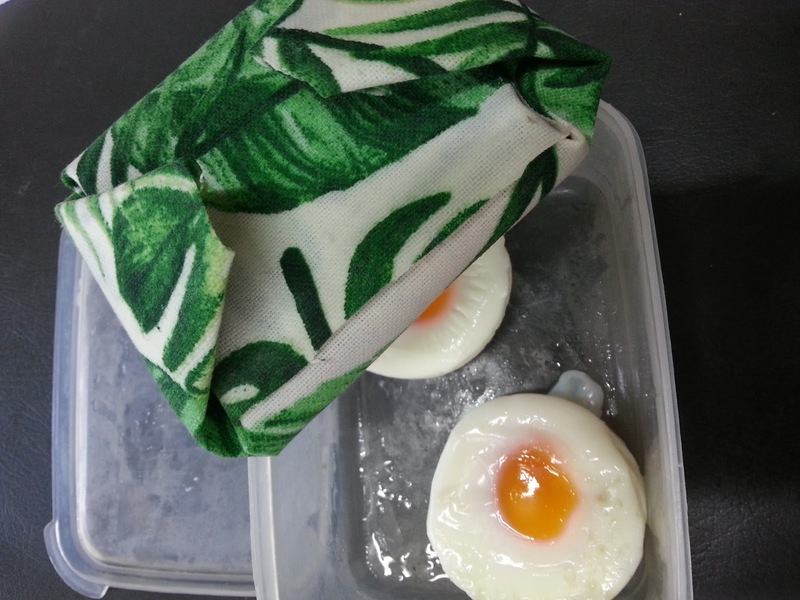 I used one to wrap my bread in to go with my poached eggs for lunch at my desk.. I will be posting a tutorial on how to make them soon! I am a bit late linking this - but I hope you all have a great weekend! We have had flooding and rain, and more flooded roads and mudslides. It was a busy week last week just trying to get around! 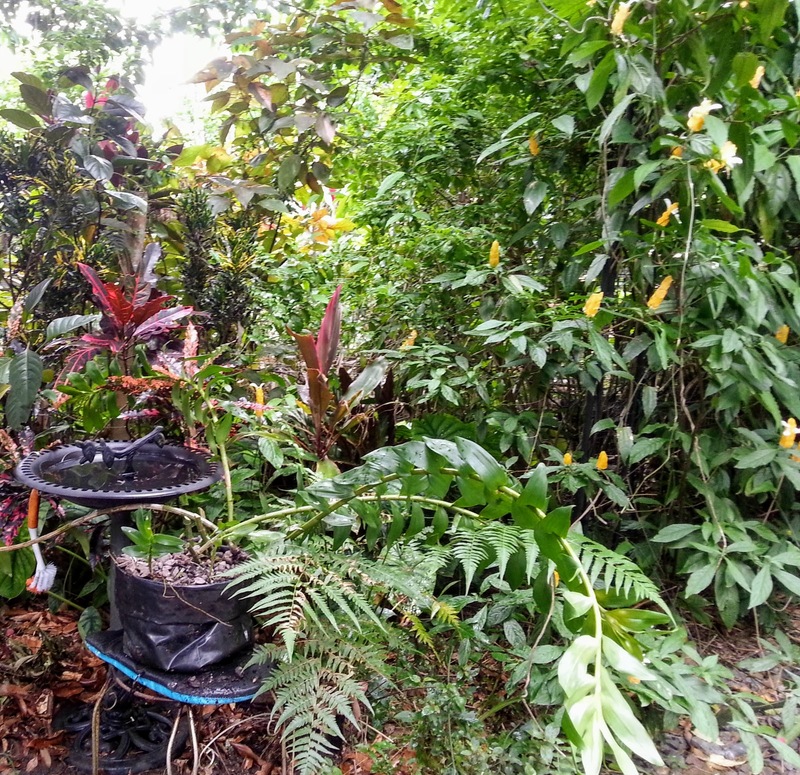 some of the plants though are in their element with all this rain. The dragonfruit has burst into flower again. I think this is the third flush of fruit this season! 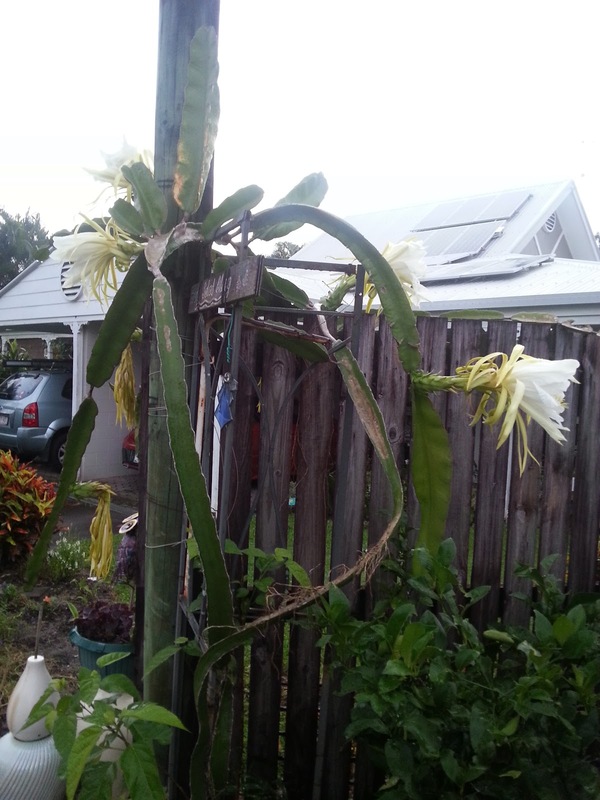 It is supposed to be part of the cactus family which I thought didn't like too much water. Shows what I know! Here you can see the native bees which gather around pollinating the flowers. There are also green ants, so not sure if it needs both, but they definitely do their job well! 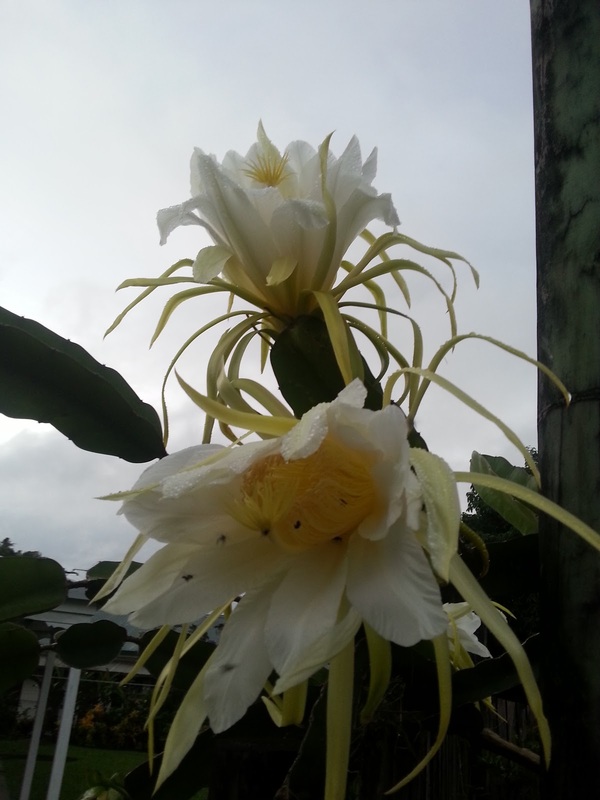 The flowers open during the night and then by the afternoon are just a hanging bunch of petals. Short but sweet life! Off to the left you can see the flowers that flowered the night before. 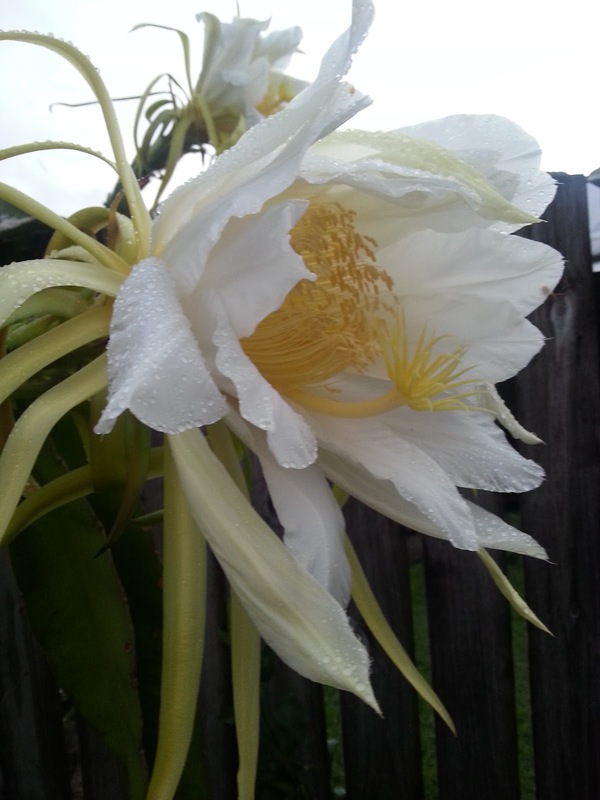 This is the most beautiful flower, followed by very tasty fruit! I know I do go on about the dragonfruit , but this yummy goodness on my yoghurt is what is to come! Every now and then I like to make something a little fancy for dinner. Seafood marinara is something we buy quite often as it is a good deal, especially when it goes on special. Sometimes I cook it with green curry paste and coconut milk, add in a few snow peas and carrots and served over rice. Quick and easy and even great as leftovers for lunches. 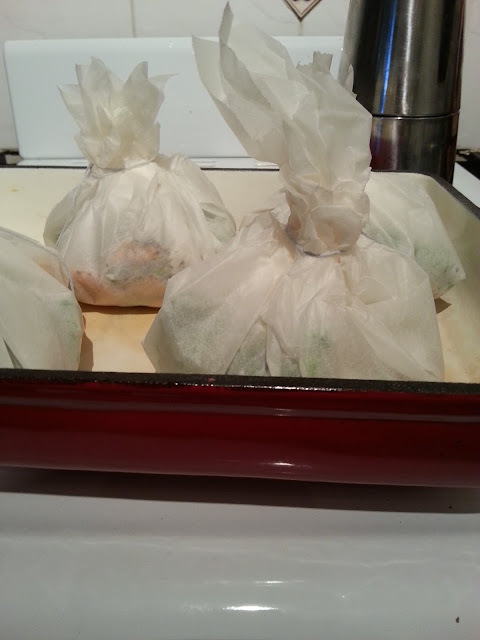 Then I had an idea that I wanted to create some fish in a bag recipes. 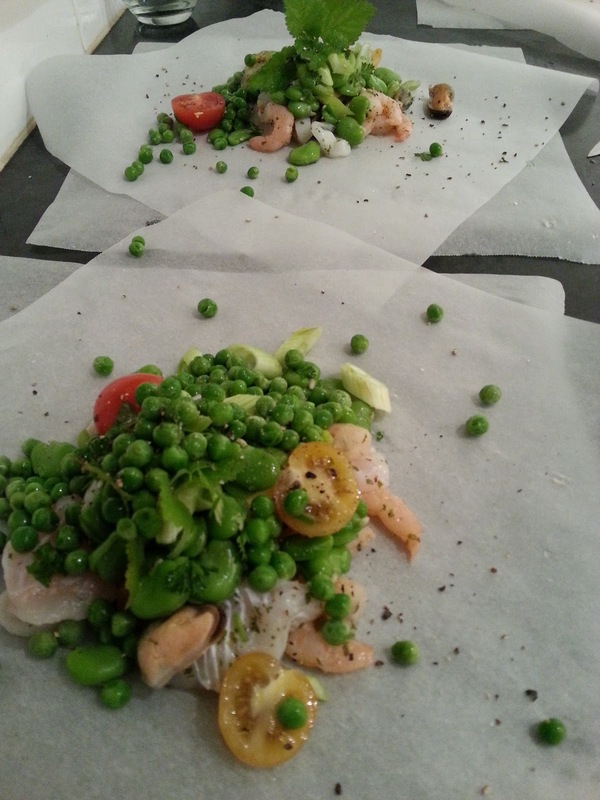 I lay out some baking paper, doubled crosswise as shown and began to layer what I had on hand. Seafood, sliced green onions, grated zest and juice of a couple of limes. Peas, broad beans and a few cherry tomatoes, halved. Some fresh herbs from the garden and a sprinkle of salt and pepper. I gathered the ends and tied them with string, then baked in the oven alongside some vegetables I had roasting. The oven was hot, about 220*C so I left them in for about twenty minutes. I loved how the flavours were so fresh and the lime especially brought a zing to the whole meal. Presentation was nice with everyone having their own little packets, but in the end we dumped them out onto our plates to eat them! 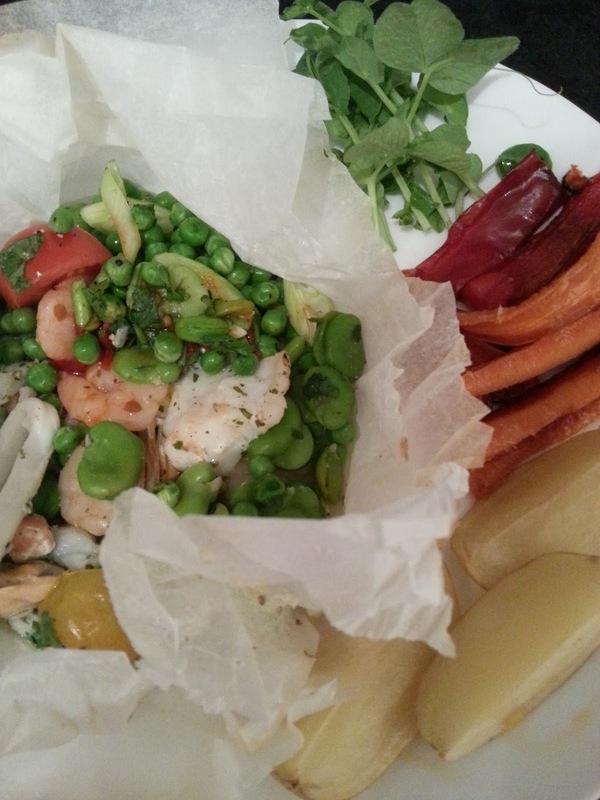 Have you cooked anything in packets? Time to get the veggie garden going again. I am very excited to be preparing the raised beds to grow my vegetables this year. I grow from seed so do not want to miss the beginning of the growing season. 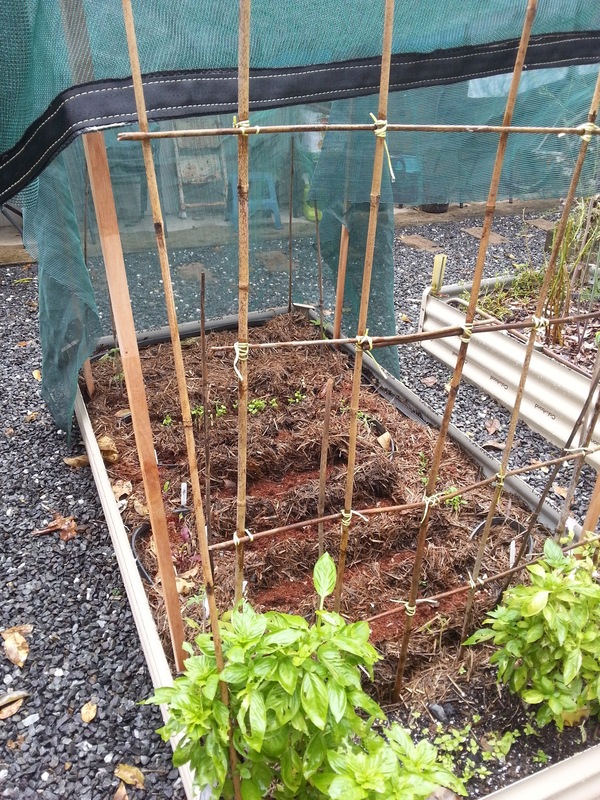 Of course we never really know when the wet season is going to end, but most people rely on April being the time when one can plant out seedlings. I might be a little early, but want to stagger my plantings, so will only start off a few each weekend. I did go a little crazy with seeds, but will share around some of the seedlings with friends and family. I am starting out marketmore cucumber, San Marzano and Tommy toe tomato, Tsakoni eggplant, and rainbow chard. 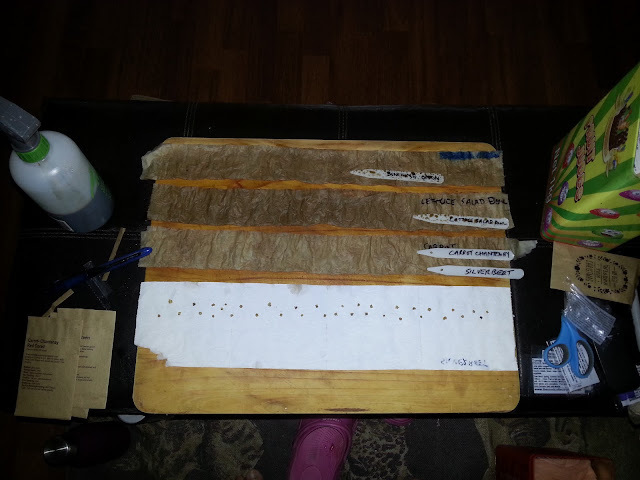 The greenhouse where I start the seeds is semi shaded, and I am making sure to water every day. 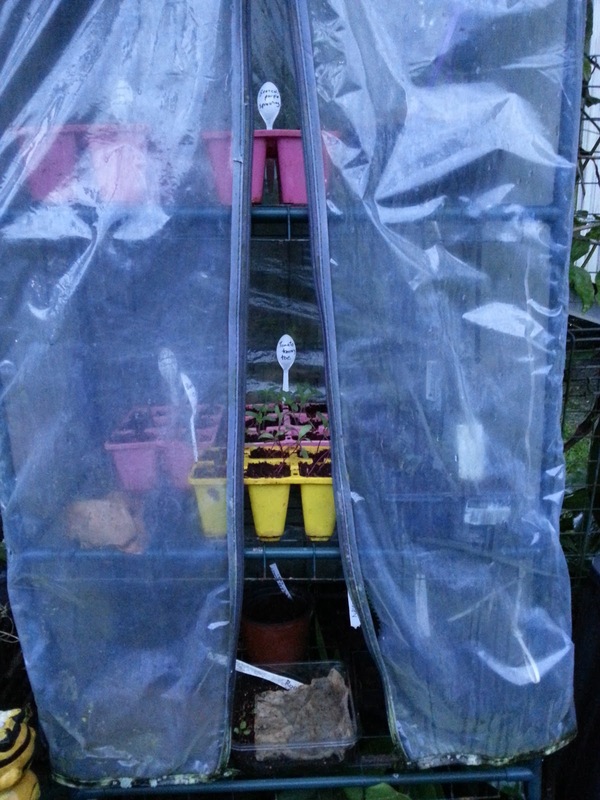 This is an old greenhouse, and the zipper no longer works, but I dont think I want it zipped up tight anyway because I want the fresh air inside. I hope to have lots of compost to add to the beds, the hughelkulture bed has broken down a bit, but will not need topping up. I will have to dig up the sweet potato and cassava, but only when I am ready to plant out seeds. Pumpkin, zuchinni, carrots, beetroot,beans, lettuce and rocket I find do better when the seeds are planted directly into the beds. 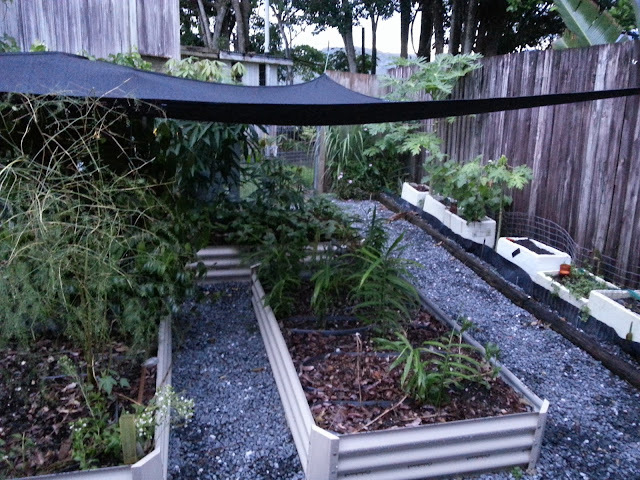 I think I might leave a couple of cassava in the back corners so they can provide a bit of shade. Since I put in the raised beds I dont have the trees that used to provide shade. 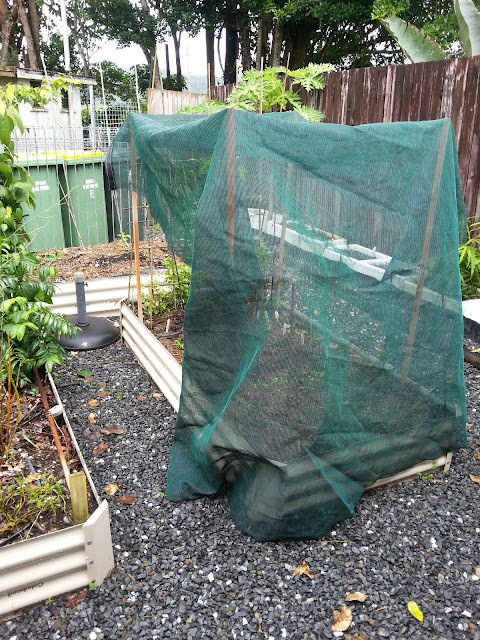 The shadecloth tends to be put up and down depending on the wind. Not perfect, but I cannot think of any other options. 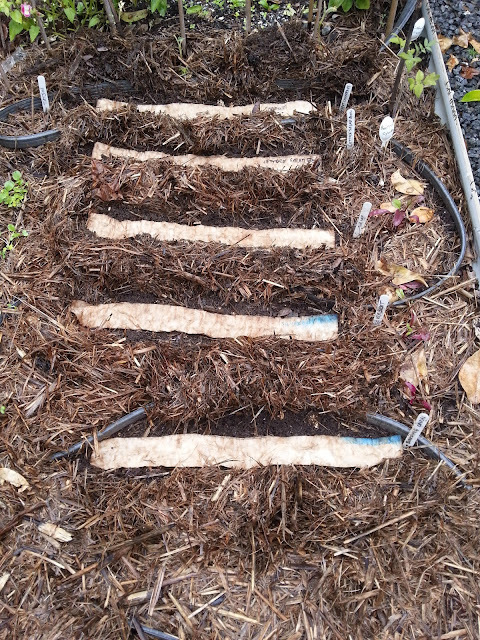 The other bed with the ginger has compacted down a bit but it was never as high as the hughelkulture bed anyway. 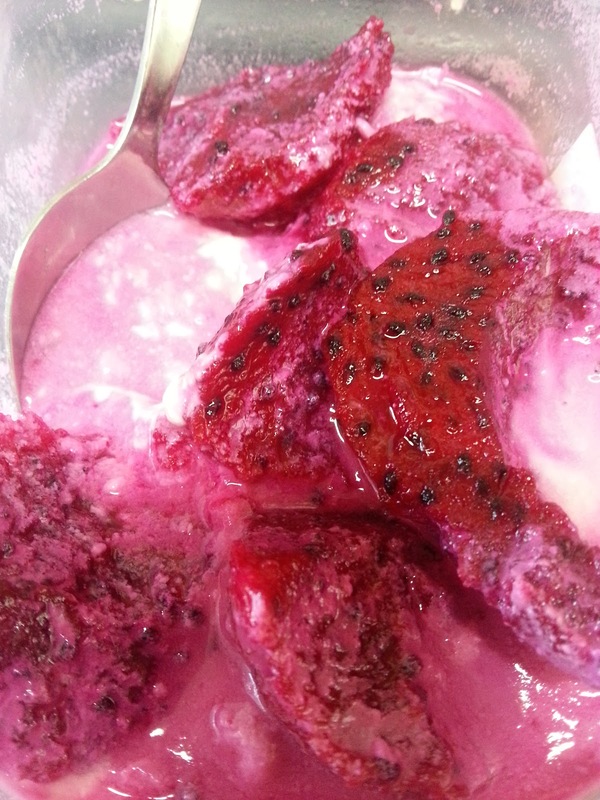 I have amended the soil with a little lime and also a bit of trace elements. I will also pick up some manure, I like the five in one. Also a bit of compost, maybe blood and bone? I have been growing sprouts and microgreens during the hot wet season. 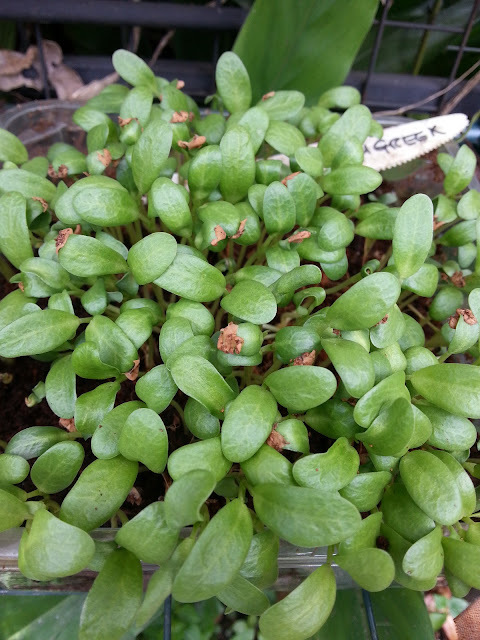 I really loved these fenugreek microgreens, and planted a few little plants into the herb spiral to see if they will grow there. I am growing them in flat plastic trays with half compost and half seed raising mix. One thing I have found really helps to give them a head start is to lay a piece of thin fabric (I have muslin) over the top, this forces the seeds to anchor themselves firmly in the ground as they are starting out. You take it off as soon as the seedlings start to push it up. My garden adds so much sweetness to my life, and I love to share it! This week on Jennys link up we are talking about colour again, and it seems the more the better! I remember making a crocheted blanket just like Jenny describes with an outline of all the mismatched squares joined together by black. During our storm a while back, while we were stuck at home for five days due to flooded roads, I decided to do something with my hands and dragged out my bits of baby yarn. I remembered that my daughter-in-law had some framed prints of squirrels and foxes in pink, cream and brown hanging up in the nursery. 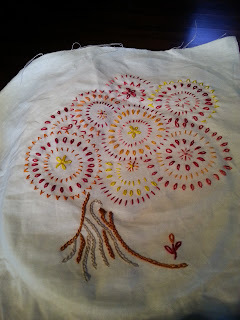 At first I really wasn't sure about that combination of colours, but it grew on me as I worked the repetitive rows. . It is just a little blanket - will be perfect in the stroller I think. I simply repeated the below pattern. 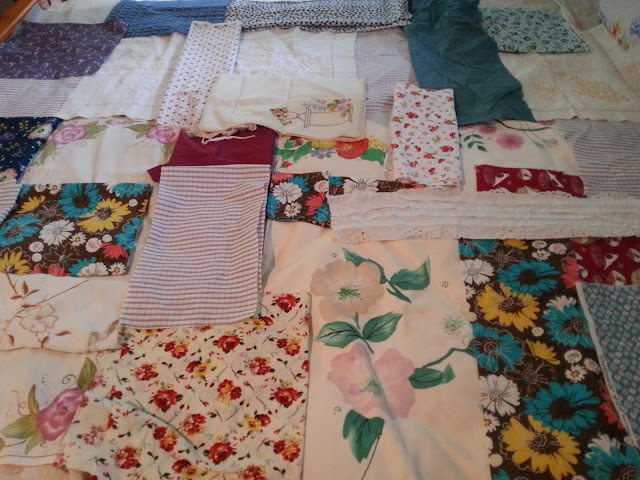 I do struggle with colour matching, and as most of my quilts have been to use up old fabrics and embroideries and painted cloths, I have to use what I have on hand and make that work. Luckily my younger daughter is available to give suggestions, - thank heavens for my camera on my phone. It gets a good workout as we mull over which colour will look better alongside which! When I made the quilt for my older daughter last year, I laid out the fabrics I wanted to use, interspersed with the fabric painting my mother had done. 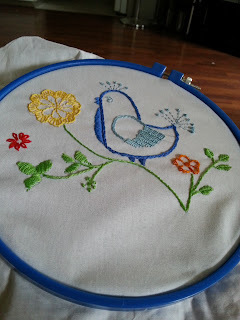 After lots of to and fro, and sewing and cutting - this is what I ended up with. A quilt that connects the memory of my Mom with my daughters and me. These are the legacies that I want to leave behind. Funnily enough the thin multicoloured strips I just started sewing together without thinking much about which colour matched and that worked out so well. Maybe a bit of spontaneity is good! Our living room definitely needs a re-do, but in the meantime I just add colourful red and yellow cushions to brighten up the drab brown couch. Colour definitely lifts the mood of a room, but I do get nervous when trying to re-plan a whole room in a different colour. The fence outside our living room has been bothering me lately. 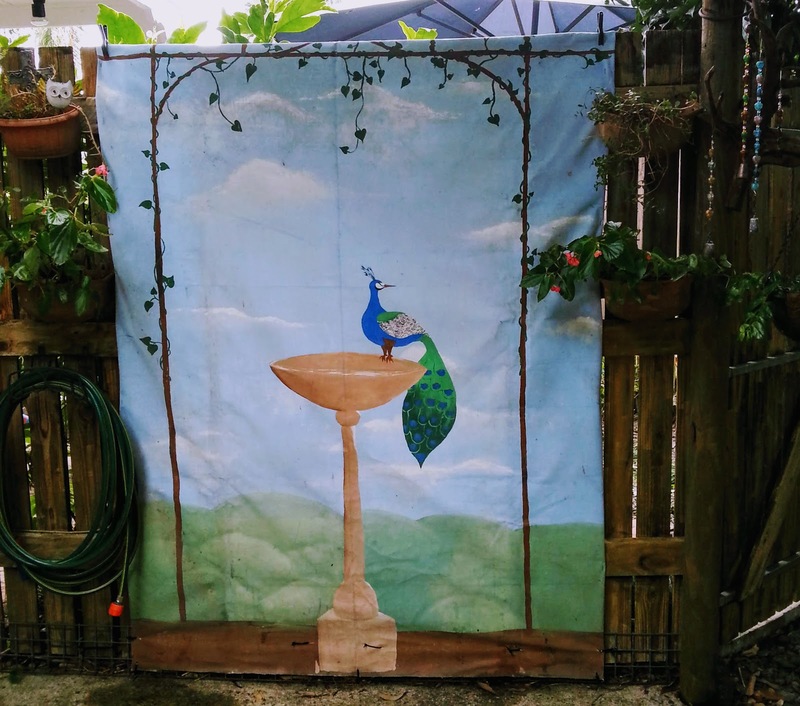 I have been toying with making it a green wall, and then I had the brainwave of moving the mural that my younger daughter made for me many years ago. I think I have found the perfect spot for it! It is semi protected by the tree above. It is so nice to look out on something pretty. We are still on the lookout for another gazebo - just watching the sales and clearance racks as they seem to have jumped up in price. I attached some plants on the sides. My dear hubby spent hours during the week pressure washing all the pavers, since they get mouldy and slippery. While I was cutting back the mandevilla on the back fence - Gosh that grows like crazy! - I discovered a hanging basket of orchids had tipped over because the plant was so heavy and the branches were reaching out and hooking into other plants. I could not straighten it in the basket, so decided I would try it on a stand in one of those plastic baskets. Filled with gravel and a bit of soil weighs the pot down nicely. It would be nice if it flowers! We will see if it stays there - it still looks a bit messy. I had to put up the big umbrella for shade while I worked on the other area that has needed work for some time. Hibiscus does not do well in my garden because I have erinose mite which I just cannot get rid of. 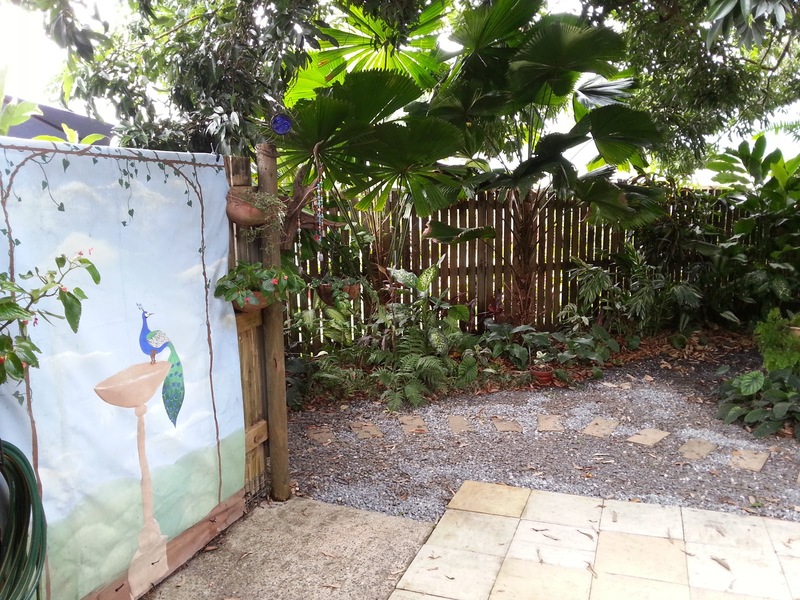 I removed two dying hibiscus bushes, the bleeding heart vine which is far too invasive for my liking, and the passionfruit vine which has been in that area for a couple of years and is no longer at its peak. Luckily our neighbour's passionfruit vine is now climbing over our back fence, so we still have passionfruit. :) It really is still too hot to be out working in the garden, but I kept up with lots of water, and then thoroughly enjoyed a swim afterwards! I have ordered some cosmos and zinnia seeds, and hopefully soon that area will look like a cottage garden! Wow! that was a busy weekend. !